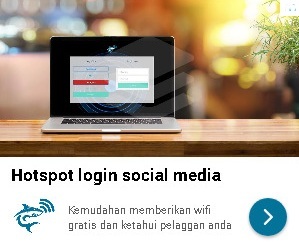 [10 Speed and Turbo Boost] Combined with the turbo function and 5 speeds settings, it can run 10 speeds. Start at a slow speed and gradually work your way up. 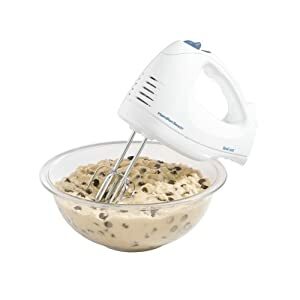 [Ultra Power 300w] With a 300w motor and turbo setting you can whisk, mix and knead to bake and cook. [4 Attachments] Includes – 2x Beaters, 2x Dough Hooks. The durable stainless steel dough hooks make mixing dough and heavier cake mixes easy. The stainless steel beaters are perfect for whisking egg whites, creaming ingredients and for light cake mixtures or batters. 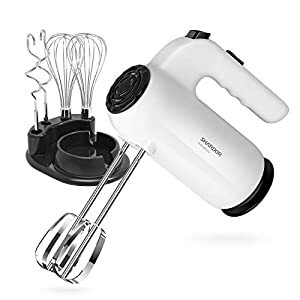 Ultra Power & Multi-purpose: Combine ingredients at speed one for slowly stirring in chunky ingredients, speed three for mixing bread batter and creaming butter and sugar, then speed five for whipping meringue. Safety & Sanitation: All the six accessories made of stainless steel are more intrinsically resistant to corrosion than others (eg.chrome-plated materials).Shardor help you create a healthy kitchen. Time-and-labor-saving: Ergonomic Handle provides comfort while mixing. 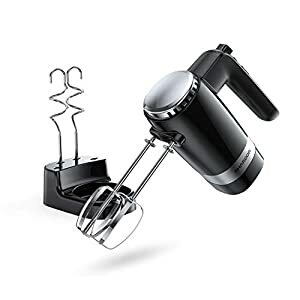 Quickly and easily remove any accessory from the hand blender at the touch of ejecter button.